Low cost luxury that looks as good as it feels! The black leather blends with any office décor. Features pneumatic seat height adjustment, passive ergonomic seating for full back, neck, leg, arm and posture support with built-in lumbar cushioning, arched armrests, two piece genuine leather cushioning, adjustable tilt tension control, upright locking option and solid five-star nylon base with double hooded wheel casters. Upgrade to a chrome base for a minimal charge. Dimensions: Back: 24"H x 20"W. Seat: 20"D x 20"W. Seat height adjusts from 18"-21"H. Warranted by Boss Office Products. 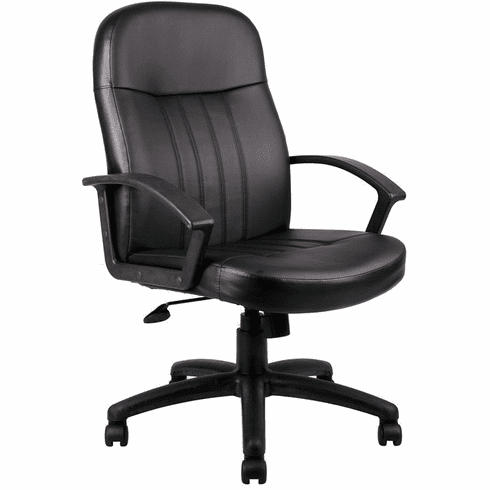 These leather desk chairs normally ship within 2 business days from our GA or CA warehouse.